Steam is one of the most popular game platforms there is. Buying unummerable games as well as managing them, chatting with friends and fellow gamers—all this is possible thanks to Steam. Today's let's take a close look at the Steam app for Android and find out if it's worth a gamer's while. All required permissions strike us as being straight-forward. Steam will be celebrating its 10 year anniversary next year. What started off as a service for the games made by the guys over at Valve has grown into a bigger platform. In the beginning Half-lite, Counter-Strike, Team Fortress and others were meant to run via Steam, get patches and regular controls for cheaters. I remember my first encounters with Steam. At some point it became difficult to circumvent, seeing that a growing number of games required the installation of Steam. At that time the programme was sluggish, unreliable and – to not mince words – downright awful. But it's come a long way since then and I no longer want to make do without it. Having one central grouping place for all of my games (nowadays external games can also be incorporated and managed within Steam) is great, as is chatting with friends and getting a regular supply of patches. Not to mention the fantastic discounts and special deals that often pop up, making it possible for users to install games at a fraction of their normal prices. The indie game scene is also thriving thanks to Steam. So much for Steam—now let's get to the app itself. First off: Steam for Android is not a platform for Android games, but rather a pared down version of the version for computer. That said, the app does provide everything one might except of it. 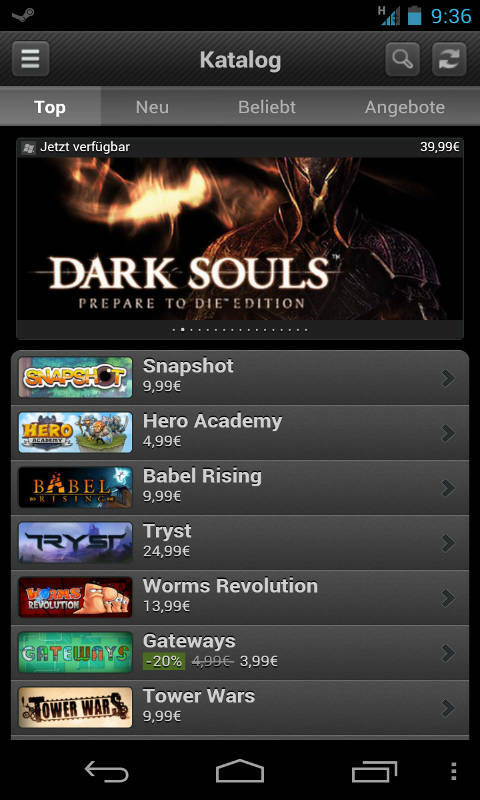 You can browse the Steam catalogue and buy games using your Android device (please note that all purchased games can only be played on a computer). I tested this with Counter-Strike: Global Offensive and everything went smoothly and I could decide to purchase or buy as gift voucher. What else can the app do? The social component is, of course, a big part of Steam. Chat with friends, check out their profiles, games and scores—all this is possible from within the Steam app. 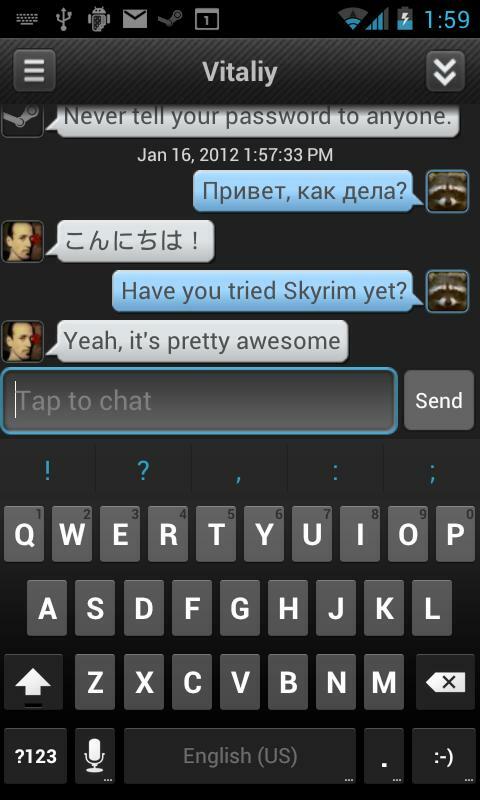 The chat feature works very well and the app also displays which friends are online at the moment. There's also a news feature, a shopping cart and wish list. The Steam app doesn't come with any extra features that users won't already be familiar with from the computer version. The app is useful to have nonetheless because it notifies users about special deals and you are less luckily to miss opportunities for purchasing games at discounted prices. It's also a fun means to chat with Steam friends even when you're on the go. In a nutshell: the app is exactly the same as the computer version of Steam, but it's useful to have and well made to boot. The Steam app looks very much like the pared down Steam client. The design is not the pinnacle of imaginative design but it's fully functional and by no means ugly. The app is easy to use overall. The Steam app resembles the Steam website in the sense that it's more of a browser than a real programme. While buttons and menus are integrated within the app, most other elements are loaded individually. If you're familiar with the Facebook app you'll recognise the pattern, which has a few drawbacks, which is why Facebook has changed its app to run on native code. This said—Steam isn't as bad as the Facebook app by any means. In fact, the app runs smoothly and feels reliable. The Steam app is available for free and without any ads from Google Play.